Tool free blade change for fast and easy change of blades. Variable speed allows for precision performance that's right for each job. Compact design maximizes user control for access in tight spaces. Includes 1 standard wood jig blade (T-shank). 0.5'' stroke length. Dust blower clears debris for better visibility. Tool-free blade release allows for quick and easy blade changes. 3 orbital settings easily adjusts cut aggressiveness across a wide range of applications. Variable speed trigger (0-2,500 spm) provides control for clean and accurate cuts. Beveling shoe provides the ability to cut 0 to 45 degree bevel cuts. Contoured over molded handle optimized for increased comfort. 20 volt max system high performance cordless platform. Includes Jigsaw and a 4" wood blade. Battery And Charger Sold Separately. Pivoting head design converts from a reciprocating saw to a jig saw in seconds. Orbital cutting technology provides a more efficient cut. Built-in blower removes dust and debris to increase cutting visibility. Compatible with standard reciprocating saw and t-shank jig saw blades. Compact and lightweight for easy use. 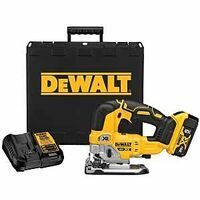 Includes: 20 volt Axis Reciprocating and Jigsaw, 20 volt Max Lithium battery, 20 volt charger, Wood Cutting Jig saw Blade, Metal-Cutting Jig saw blade, Aluminum-Cutting Jigsaw Blade, and Wood-Cutting Reciprocating Blade. Tool only, batteries and charger sold separately. Variable speed for versatility in a multitude of materials and applications, 4-position orbital action, keyless lever-action blade clamp, all-metal keyless shoe bevel with detents at 0, 15, 30 and 45 provides versatility for easy bevel cutting, adjustable dust blower, batteries provide long run-time and battery life, anti-slip comfort grip. Specs: 18V, strokes/min 0-3,000SPM, stroke length 1", keyless blade clamp, dust blower, weighs 7.5lbs For making quick cuts in wood, metal, wall tile, or plastics. Hybrid Grip design delivers greater control by bringing the grip closer to the materials with a variable speed trigger. Smooth cutting designed to minimize vibration by keeping the weight over the cutting area. LED light and fuel gauge illuminates the cut line and displays remaining run-time. Spec: 0-2,800 SPM, 3/4" stroke length, Quik-Lok T-shank blade clamp, 45 degree bevel capacity, tool-free lever bevel adjust, counterbalanced mechanism, and weighs 4.2 lbs. Includes M12 compact Red Lithium battery, 30-minute charger, milwaukee 10 TPI wood cutting t-shank jig saw blade, anti-splintering insert, non-marring shoe and contractor bag. Specs: all-metal lever action keyless blade change, all-metal keyless shoe bevel with detents at 0-, 15-, 30- and 45-degree angles, 4-position orbital action, adjustable dust blower, anti-slip comfort grip, 0-3,000spm, 1" stroke length, and weighs 5.4 lbs. Accepts T-shank jig saw blades. Includes blades. Uses 20V MAX Lithium Ion. Battery not included. Built-in, shockproof, high output, LED light illuminates the line-of-cut. Tool-less push-in lock blade change system for more productivity. Low vibration and noise level for more control and comfort. 25-minute rapid optimum charger communicates with the battery and built-in CPU chip in the charger. Accepts T shank blades. Specs: 1" length of stroke, max cutting capacities: 5-5/16" wood, 3/8" steel, 3 orbital and 1 straight cut settings, 45-degree bevel capacity, 0-2,600 SPM and weighs 6.1 lbs. Uses 18V LXT lithium-ion battery (battery and charger not included). Includes blade set, cover plate and anti-splintering device. Specs: all-metal lever action keyless blade change, all-metal keyless shoe bevel with detents at 0, 15, 30 and 45-degree angles, 4-position orbital action, integrated dust blower, anti-slip comfort grip, 0-3,200spm, 1" stroke length. Bright LED light helps to illuminate dimly lit work surfaces. Accepts T-shank jig saw blades. Includes: (1) Jig Saw, (1) charger, (1) 5 Ah battery and case.